Engage with the PLE Value Proposition in a Meaningful Way! 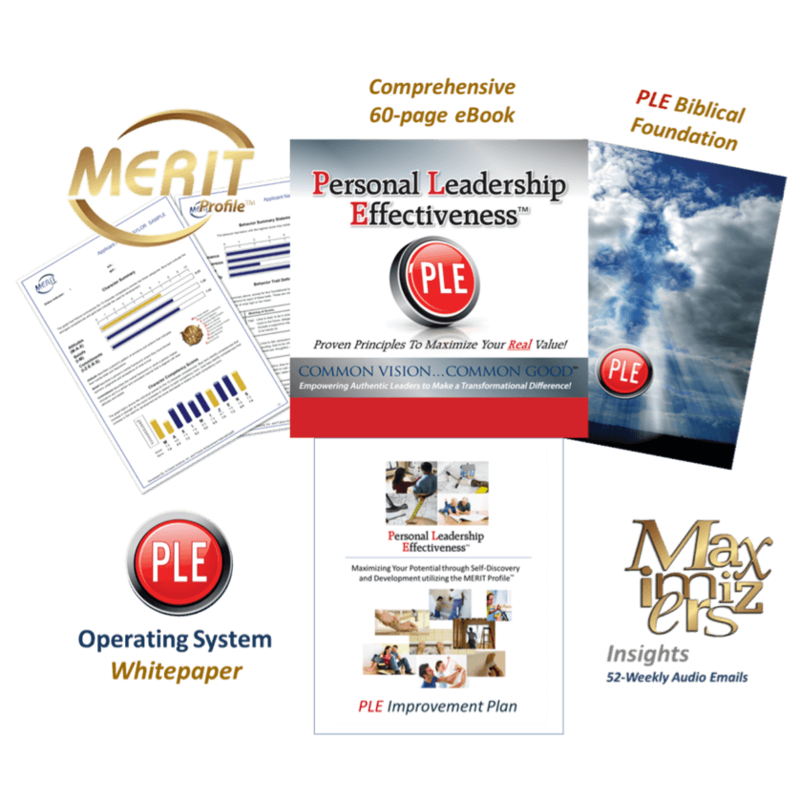 Materials Include: Comprehensive 60-page PLE eBook, 13-Page MERIT Profile Development Report, 13-Page PLE Whitepaper, PLE Improvement Plan, PLE Biblical Foundation Document, 20-minute recorded tutorial, plus an annual subscription to MAXIMIZERS Weekly Insights (52 weekly motivational email audio messages). Benefits: This Introductory Package will give you a deeper understanding of how your overall Attitudes, Beliefs and Commitments are affecting your success and significance in life, whether on a personal or professional basis. 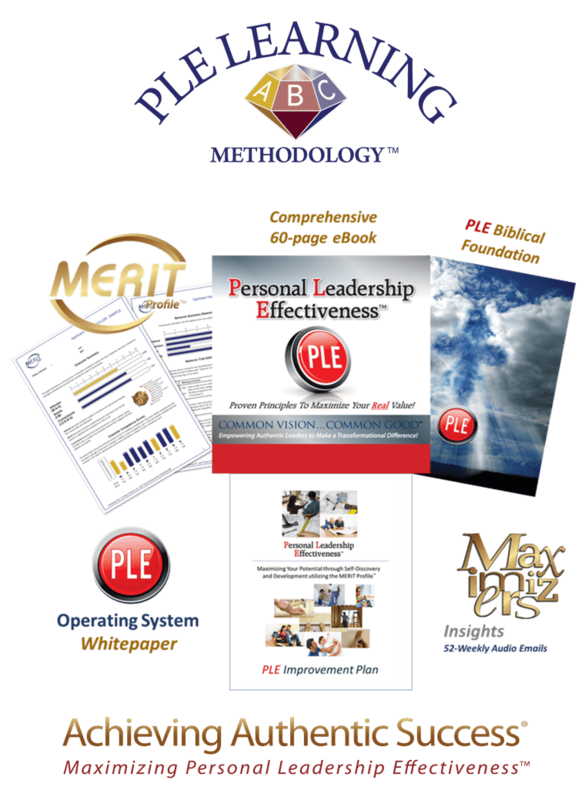 The insights gained into your Personal Leadership Effectiveness through the results of your MERIT Profile Assessment will motivate you to develop a Personal Improvement Plan that will move you in the direction of improved performance, productivity and work/life balance. By employing the tools provided in this Special Offer, your life will be positively impacted for years to come. Each module incorporates the data findings of your MERIT Profile that significantly enhances the overall learning experience. Change habits and personal disciplines. Deal with fears, problems, and other difficulties. Build a sense of personal mission and purpose. Develop balance in attitudes, priorities, and goals. Listen, confront, empathize, and coach. Make mid-course corrections and handle change. Stay focused and not quit on the important issues. Perhaps you are interested in joining the many senior men and women that have become Professionally Certified so that they can deliver our various PLE Initiatives to either the Marketplace and/or within the Church. Your purchase of one of the Special Introductory Offers will be 100% credited toward the cost of any one of our professional Certification Options. Additional information will be sent to you regarding the various Certification Options when you purchase one of the Third Act Special Offers. This way you can more closely examine the details of each option to determine which specific opportunity best aligns with your Passions, Experiences and Gifts (PEG) and your business and/or ministry objectives. 20-minute recorded tutorial, plus an annual subscription to MAXIMIZERS Weekly Insights (52 weekly motivational email audio messages).